In the world of hair loss cures and remedies, scalp micro-pigmentation is a relatively new idea originally pioneered by HIS Hair Clinic in 2002, although a number of different companies now offer a pigmentation service including Good Look Ink, Vinci Hair Clinic, Milena Lardi and Skalp. Certainly there is a lot more choice in the market now, and it really does pay to fully research your provider before committing to treatment. 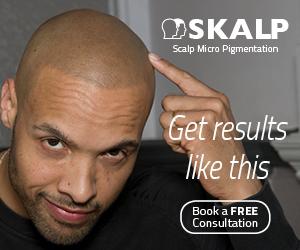 So what is scalp micropigmentation? Scalp micro pigmentation, or SMP for short, is the process of pigmenting the scalp to make it look like you have a real head of shaved hair. It is a highly skilled process and contrary to popular belief, should not be attempted by tattoo parlours or cosmetic pigmentation specialists as the technique and equipment used is quite specific. Ultimately shaved hair appears as thousands of small ‘dots’ on the scalp, and SMP aims to replicate this effect using pigments that are effectively tattooed into the skin. When applied by a skilled specialist SMP can look extremely realistic, no doubt about it. The extent to which real hair dots can be replicated is quite astonishing actually, so it is easy to understand how scalp micropigmentation has grown in popularity so rapidly. The most important considerations are the design of the hairline (as this is easily the most noticeable area of ‘hair’, and the shade and density match where the pigmented area meets the hair. Different companies use different methods but ultimately for maximum realism, the hair must match the pigment dots as closely as possible. How does the scalp pigmentation process work? Generally speaking, SMP treatments can be completed in 6-10 hours split over 3-4 separate sessions. The actual time required can vary considerably depending on the style you require, the extent of your balding and the size of your head, as well as other factors such as your rate of pigment fade. More on this in a moment. Before treatment can commence, it is important that the practitioner or clinician fully understands your requirements. To this end, a discussion usually takes place during a meeting or consultation to decide on the hairline shape and position, your required density and shade and a host of other specifications. The video above shows a client who went to HIS Hair Clinic for treatment, a company with offices in the United Kingdom, United States and Europe. How does fading influence the treatment? When each dot is applied, it creates a tiny wound in the skin that scabs over in order to heal itself, with the pigment deposit held underneath. As the scabs fall away, they take with them a portion of the pigment. In addition to this, the pigments are attacked by the immune system and subsequently shrink. These two factors result in a shrinking and lightening of the dots, most noticeable during the first few weeks after a treatment session. 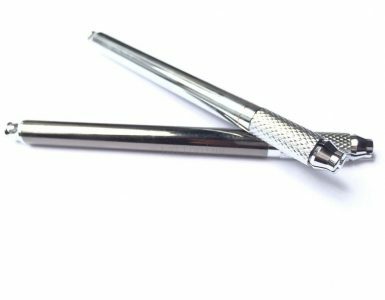 This gradual fading differs from person to person, so it is therefore necessary to apply an SMP treatment over a number of sessions so that the required pigment shade, dot size and density can be correctly judged. For these reasons, your personal rate and extent of fading doesn’t really influence the final result, but it can impact on the number of sessions you require to complete your transformation. It makes sense therefore to ask your SMP company for a fixed quotation to complete the treatment, not a per-session price as this could leave you out of pocket. Most people describe the process as uncomfortable, although not necessarily painful. The sensation is not dissimilar to that experienced whilst having a tattoo, although the discomfort is more of a pulse than a constant. Painkillers such as codeine, paracetamol and ibuprofen may help, although a positive state of mind and a can-do attitude are likely to have a much more therapeutic effect. Certainly the sensation is nowhere near as painful as a hair transplant procedure, for example. 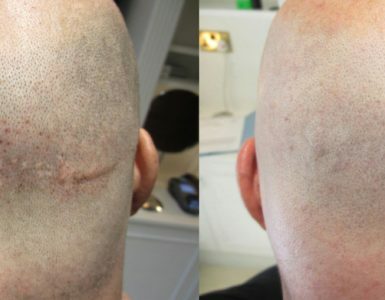 A full scalp micropigmentation treatment generally costs around £2-3000. Some companies charge per session, others per hour and some offer fixed pricing. More competition has really opened up the market, and consumers are in a stronger position than ever before to negotiate a good deal. However, it is critically important to avoid shopping around on price alone. There are vast differences in the quality of treatment offered, so if you think you’ve found a great deal, ask to see their portfolio so you can see exactly what you’re getting for your money. Who are the main specialist companies? Please note this list is provided for information purposes only, and does not constitute any sort of recommendation, implied or otherwise. We cannot provide links to specific websites or contact details, so you’ll need to look these companies up. Alternatively if you are seeking a specific recommendation,see our recommendations page. I am happy to suggest the most suitable provider depending on your requirements and your location, and my advice is free, unbiased and without incentive.